The Americas: Economies grow, democracies shrink. What does corruption have to do with it? For the Americas, 2012 was largely a positive year in many ways. As important economic and social indicators show an improvement, there is a sense of optimism throughout the region, especially in Latin America. While the United States’ presidential campaign, which polarised ideas and citizens earlier this year, focused on the still weak economic situation, many Latin American and Caribbean countries have high growth rates and show signs of poverty reduction. Exports climbed in both volume and value, the middle classes grew significantly, and foreign investment returned strongly to the region. Poverty rates decreased by more than 15 per cent In Latin America and theCaribbeanin the last decade. Coupled with these positive developments is the fact that democracy seems to have become firmly established as the predominant system of government in a region where, only a few decades ago, dictatorships and civil wars were the order of the day. All these points are reasons to celebrate. But is the picture really that rosy when looking at it in more detail? This is where corruption steps in. 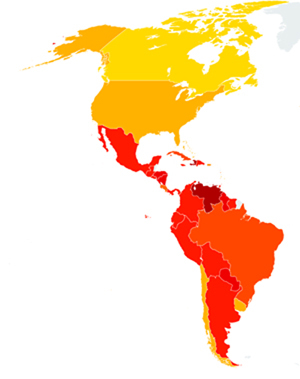 As the Corruption Perception Index 2012 launched today shows,Latin America as a region is doing worse than the global average. The Index ranks 176 countries according to their perceived levels of public sector corruption, 32 of which are in theAmericas. Two-thirds of those do not even make it to the middle of the global ranking – indicating that corruption is a serious problem in many countries. There are several challenges ahead for the region which, if not tackled, could reverse the progress made. One of them is that despite formal economic growth, it is still the most unequal region in the world. Twelve out of the twenty countries worldwide with highest levels of inequality are from the region. Another one of the main pending issues for some countries of the region is, no doubt, democratic governance that goes beyond election day. Democracy should not be seen as merely the act of voting for a candidate but rather as exercising our rights as citizens. Democracy should be ‘lived’ in our day-to-day lives. By demanding and receiving information to understand how our taxes are spent; by expressing ideas and opinions freely and without fear of repression; or, by knowing that one will be treated in a fair and impartial manner by an autonomous and professional judiciary. These are just a few of the hundreds of ways in which a well-functioning democratic regime manifests itself. When these features are missing, democratic governance does not operate properly regardless of the existence of elections, and the social pact that allows people to live in peace, in stability and to progress is severely hindered. Here is where too many countries in the region fail, frequently as a result of corruption, bribery and lack of transparency. Also, as surprising as it might be at first glance, Honduras and El Salvador are among the most violent countries in the world. Honduras is, in fact, the most dangerous with a homicide rate of 82 homicides per 100.000 inhabitants. While the global average is nine, the Latin American one is 27. Both income inequality and violence are directly linked to and a consequence of weak democratic governance and corrupt practices. Drugs, weapons and human beings can hardly be smuggled without bribe paying, abuse of state resources is hard to achieve when there are autonomous watchdog institutions, and policy decisions cannot favour specific groups against the benefit of the majority when there is transparency. All these factors, bribes, lack of autonomy, impunity and limited access to public information, among others, enable corruption. Unfortunately, there are numerous examples demonstrating this: Guatemala has a record 98 per cent impunity rate, showing a dramatic lack of justice in the country. In Mexico, seven journalists have been murdered up to mid-November in this year alone for doing their job. During the 2012 Venezuelan presidential campaign, President Chavez’ abuse of state resources shows that out of 5271 minutes of airtime that he used, according to law, to transmit issues of state affairs from January to July, more than three-quarters were broadcast in July alone, when the official campaign period started. It is clear that besides growing economies, what theAmericasurgently needs are the policy decisions and actions that support fairer distribution of wealth and democratic powers. To get there, the region needs leaders that think about long-term policies, stable and modern institutions, as well as citizens able and willing to exercise democracy in their daily lives. In the United States, historically, one of the challenging factors has been a relatively low demand or priority for adding the fight against corruption to the policy agenda. However, there is an increasing recognition that corruption is a problem. 81.7 per cent of US citizens believe that political corruption played a major role in the financial crisis, and before the recent elections voters said that reducing corruption in the federal government was an extremely important priority for the next president to address, just after job creation. It is now time for policy makers to take action. In theAmericasregion as a whole, the country which shows the biggest change according to the Corruption Perceptions Index sources this year isColombia. Despite the government headed by presidentSantospushing for many institutional reforms, including a new anti-corruption law, it is now time for these reforms to show concrete outcomes and for the judiciary system to tackle impunity related to corruption. Punishing those that engage in corruption is essential for the country. Nonetheless, in some countries of the region, there is good momentum to continue building anti-corruption efforts, hand in hand with growing economic perspectives. A positive example this year is Brazil, where together with the approval and implementation of important laws like the Clean Record Bill which limits the access of individuals with pending judicial cases to politics and the Access to Information Bill, the Mensalao (or “Big Monthly Payment” in English) case has shown that impunity does not prevail for cases of corruption. Sentences that added up to more than 250 years in prison were given to 25 out of the 37 individuals who were on trial, including prominent political figures. Decision makers and citizens should not forget that present and future economic prosperity needs to be accompanied by democratic governance and corruption eradication. If not, growth will not be sustained and serious problems like inequality and citizen insecurity will continue being characteristics that hinder progress in the region.